Hello and happy Monday! The festive holidays are almost upon us, can you believe? Personally, I enjoy a bit of metallic sparkle at Christmas and New Year's Eve. My current favourite is a combination of gold and white. How about you? Einen schönen guten Morgen zusammen! Mit großen Schritten nähern wir uns dem Weihnachtsfest. Kaum zu glauben, oder? Zu festlichen Anlässen mag ich gern die Kombination Gold und Weiß. Und welche Metallfarbe mögt Ihr am liebsten? schöne Dinge hast Du wieder ausgesucht! Great moodboard to start the new week! Beautiful things. I love the combination of white and gold, too. Thank you. I think white and gold go perfect together, great monday finds! It is kind of hard to believe that we are headed into another holiday season already. The year sure flew by. White and gold is one of my favorite color combinations! (Gold with any neutral, really.) That small purse is SO pretty. I love your picks for the New Year party! Perfect! 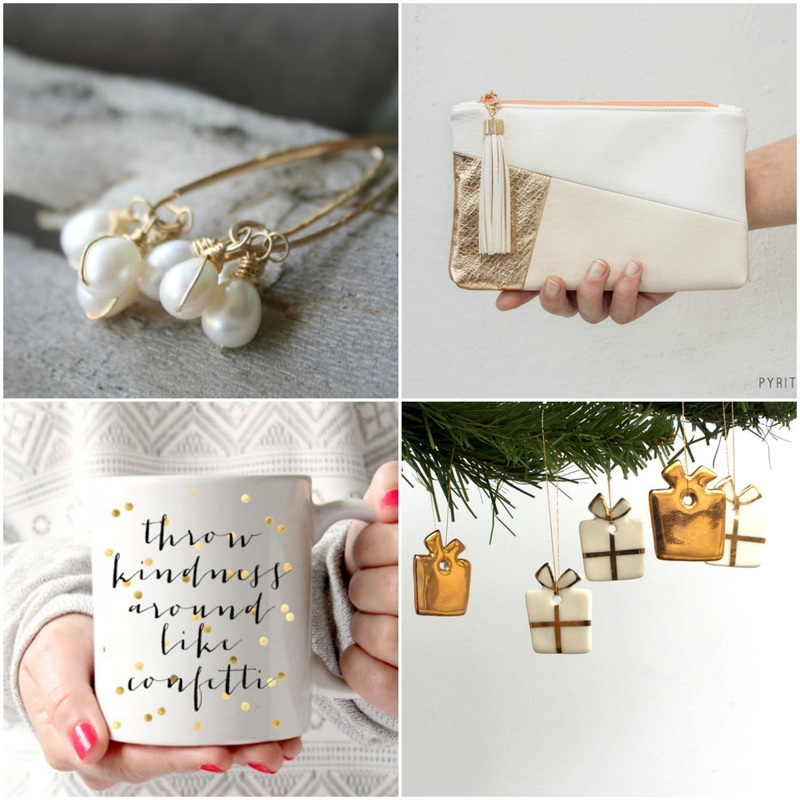 Gold is always so looks festive and it never can go out of style! Gorgeous findings!!!! Over the years, I have come to really enjoy silver. BUT this past year, gold has gotten a lot more modern and classy. These are fabulous! The earrings are fabulous! I'm not usually a gold person, but I agree that gold and white have a very holiday feel to them. Gold und Weiß geht immer, vor allem bei den schönen feinen Dingen, die Du uns wieder ausgesucht hast. Vor allem die Ohrringe würde ich sofort nehmen. Aber da Du fragst: Ich habe gerade geschwärztes Silber entdeckt, eine Schmuckdesignerin bei uns im Kaufhauskollektiv macht da ganz sensationelle Sachen. Eine schöne Woche Dir, lass Dich nicht zu sehr stressen! SO pretty! And I love the saying on that pretty mug.